Why is Homeland so good? 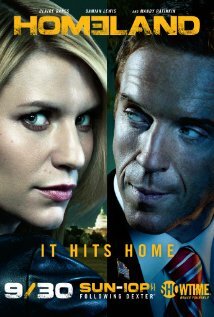 It won instantaneous critical acclaim upon its release and grabbed the Golden Globe for Best Drama Series and Best Drama Actress (Claire Danes) and a nomination for Best Drama Actor (Damien Lewis). Now it’s up for nine awards at next week’s Emmy Award and will most likely net Danes her second major award for the series and is a serious contender to end Mad Men’s four year streak. I just finished re-watching the premiere series ahead of the September 30 return and realized why I find it so incredibly enjoyable (and my favorite drama in years). Aside from the tremendous performances from Danes, Lewis (a Brit playing an American POW) and Mandy Patinkin, it’s the actual story that pulls me in. Of course the premise is intriguing, but I’m referring to the meat of the story. The heart and soul. Basically it comes down to the fact that I want so bad for Carrie Mathison to prove her doubters wrong. I want Sergeant Nicholas Brody to turn out to be a terrorist just so Carrie can have her moment to gloat. It was easy in the beginning to root for Carrie’s theory. Sure, it was warming to see Brody come back to his family, as murky as his relationships would be, but it was easy to look past that and to want him to be the villain of this show. So many clues seemingly pointed in Brody’s direction of his terrorist leanings. Or did they? It depends on if you believed Carrie or not. I thought the razor blade incident in “Blind Spot” (episode five) was a clear sign of Brody’s guilt. Even though it ended up being the work of an unnamed mole in the CIA, I still wanted it to be Brody. Then a funny thing happened. “The Weekend” (episode seven) happened. A lot of criticism arose from this because it took time away from the main plot to develop Brody’s innocence and to explore Carrie and Brody’s uniquely complicated relationship. All of a sudden I wanted Brody to be innocent. I wanted the recently returned from the dead Tom Walker to be the lone gunman. It forced me to believe Carrie was wrong and that we had to move on. If you watched this season you obviously understand the inner turmoil it caused. You were there for the twists and turns that led us back to the realization that Carrie was right all along. It’s this rollercoaster that makes this show so compelling. It’s a thriller without ever being a thriller. The complaints are that Homeland moves too slow. But does it? In the course of 12 episodes I felt there were a series of main arcs that introduce naturally and, presumably like in the real intelligence community, fizzle out as a new lead arises. First we have Carrie’s surveillance of Brody. Second is the two’s relationship and Tom Walker as the number one suspect. Once that ended it turned into the audience understanding Carrie was right all along. Homeland works because it doesn’t go the way any of us want it to go. I’m sure some viewers could have guessed one plot point or another. – sometimes maybe even episodes ahead of the fact – but that doesn’t mean we ended up where we thought we’d be a mere 12 episodes prior to Brody strapped to a suicide vest. Many cried foul at the shock therapy ending. It left a lot to question. Would Carrie remember Issa’s name and Brody’s connection? How would she cope with life outside of the CIA? Who exactly is the mole within the investigation? What’s Abu Nazir’s master plan now that he has a follower in the United States Congress? The second season premiere – “The Smile” – doesn’t try to answer all of those questions or the many more burning in our minds. Instead it picks up with a suspenseful episode that bides its time. It bridges the gap while setting up this season to follow the critically acclaimed first season. This Emmy-nominated (and soon to win) show works for all of the right reasons, and if you thought it’d hit a sophomore slump: guess again. Catch the new season on September 30 on Showtime.